You won’t believe this Cauliflower Tabbouleh Salad isn’t the ‘real thing’ once you taste it! A salad filled with ripe juicy tomatoes, cool crunchy cucumbers, thinly sliced green onions and loads of fresh parsley – all dressed up with lemon juice, oil, a bit of garlic and just enough salt and pepper to bring it all together. 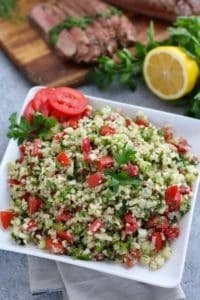 Since going primarily Paleo/grain-free over 4 years ago I’ve been missing my favorite tabbouleh/tabbouli/tabouli (however you want to spell it!) salad. Since it’s traditionally made with bulgur (aka wheat) it’s not gluten-free so I set out to recreate this summer salad wonder. Now, the question you’re likely asking…”Did it turn out? !” <== Because every food blog needs a good cliffhanger… ???? Introducing, Cauliflower Tabbouleh Salad. A Google search will show you that I did not invent this recipe. I’m not THAT smart. But I did put my own twist on it – like adding more garlic (because garlic!) and extra veggies. Because veggies are where it’s at, folks. Allow me to pull out my soapbox for just a minute here: We humans eat far too few vegetables. Especially those following the US Dietary Guidelines or Choose My Plate (which says 2-3 half cup servings per day is adequate) or those who live in ‘food deserts’ and/or are low-income. And that, frankly, breaks my dietitian heart. 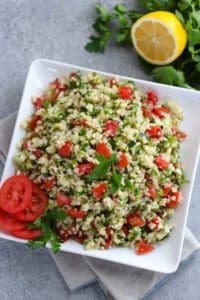 There are so many benefits of eating vegetables but I won’t go into all them all here because you came for the Cauliflower Rice Tabbouleh recipe – not a giant science-y post this like this one. Just know that half of your plate should be filled with glorious non-starchy and/or leafy green vegetables for at least two meals per day. Bonus points for veggie-heavy frittatas and breakfast salads or soups! Most importantly, do what you can do with what you’ve got. Keep things simple. That’s partly what I love about this salad. None of the ingredients are exotic and they’re reasonably priced – which hopefully translates into more veggies on your plate even on a budget. Okaaaaaayyyy, back to the salad. It’s sooooooo yummy, you guys! And lightly sauteeing the riced cauliflower before tossing it with the rest of the ingredients is key for mimicking that chewy texture you get with bulgur wheat in the traditional version. About that riced cauliflower – I chose to buy mine already riced from Trader Joe’s for this recipe because I didn’t want to mess with grating a cauliflower and the bag was just what I needed at 4 cups. Did I pay a little more? Yes. It would have been more budget-friendly to grate my own (and I could have opted for organic but since cauliflower is ranked #38 on the Environmental Working Group’s full list of data for pesticide residue on fruits and vegetables I opted not to get my undies in a bundle over this and instead choose the convenient + conventional option because I was pressed for time). I have other fish to fry and things to get my undies in a bundle over – cauliflower need not be one of them. If you don’t already know about the EWG and it’s Dirty Dozen and Clean Fifteen lists, you should. It’s good stuff and can it help you make the most informed choices when it comes to balancing health and budget (because not everyone can afford to eat organic 100% of the time – present food blogger company included). So, there you have it. 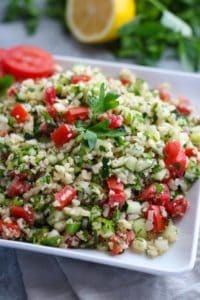 My hopefully very compelling reasons as to why you need to try this Cauliflower Tabbouleh Salad and make it a summer staple. It holds up beautifully in the fridge for a few days so feel free to make it ahead during your weekend meal prep (hello, tasty weekday lunches) or take it with you to a potluck for a dish you a) know you can eat, and b) know is freaking awesome. Cheers to summer salad season and alllllll the veggies on your plate! A fresh grain-free take on a traditional Middle Eastern dish! 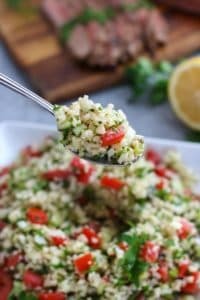 We’ve replaced the bulgur wheat with lightly sauteed cauliflower ‘rice’ for a gluten-free and paleo-friendly side dish to serve with your favorite protein or share at your next potluck event. Place a large skillet over medium heat. Add 1 tsp. avocado oil. When oil starts to shimmer, add the riced cauliflower and stir. Continue heating and stirring until cauliflower starts to release some of it’s moisture and is crisp tender (don’t overcook it – you want it a little ‘al dente’ or ‘toothy’). Remove from heat and continue to stir for a couple more minutes to help the moisture evaporate as the cauliflower cools. Spread onto a large plate or baking sheet and set in the freezer while you make the dressing and chop the veggies. Add dressing ingredients to a blender and blend on high until well combined. (Alternatively, you can finely mince the garlic then whisk dressing ingredients in a small bowl if you don’t have a blender. When cauliflower is cool, place in large bowl with cucumber, celery, tomatoes, onions, mint and parsley. Store unused portion in a covered container in the fridge for up to 4 days. Which salads do you miss from ‘back in the day’ and wish you could recreate? Leave a comment below and we just may recreate it for you with a real food twist! 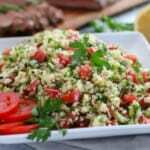 I combined this recipe with another tabouli recipe. Added a bell pepper (chopped) and a shredded carrot. Optional feta cheese and kalamata olives (chopped) for garnish. This is great for my meal prepping. I didn’t have Roma tomatoes so I used sliced grape tomatoes. I omitted the parsley and added a tablespoon of red wine vinegar to add a little freshness to it. I love how you can play with the ingredients a bit to get what you want. Thanks for the recipe! Great idea to use grape tomatoes and a little red wine vinegar in place of the parsley. Glad you found a recipe that works for your meal planning! I tasted some premade cauliflower tabbouleh at Trader Joe’s. As soon as I got home, I Googled for a recipe. Yours sounds great! Hope you enjoyed the Cauliflower Tabbouleh. Thanks for the catch on ‘deserts’. Guess I had ‘desserts’ on the brain…. You should complain to google. They put add right over instructions!!! Thanks for pointing this out – the ad overlaying the text was a caused by an error on our site that has been resolved. We apologize for any inconvenience it may have caused. Love the addition of olives, tahini, and avocado! I’m glad we could help you break that mid-Whole30 rut, too. One of my favorite salads! Made this for a dinner party the other day and everyone was asking for the recipe!